His idea was brilliantly simple: then, I got involved. The event unfolded innocently enough. 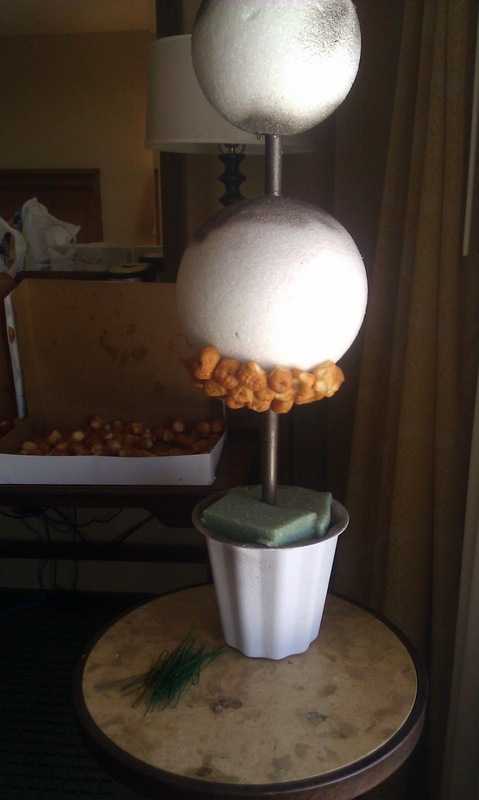 Sprout #3 wanted a donut-hole tower instead of a traditional groom’s cake at the wedding reception. Cool concept and making it happen appeared to be fairly easy and straightforward. We would use the donut tower as a ‘display only’ piece and we would put fresh donut holes in cute cupcake papers around the bottom of the tower. Wedding guests could easily pick them up and enjoy. Easy-peasy! 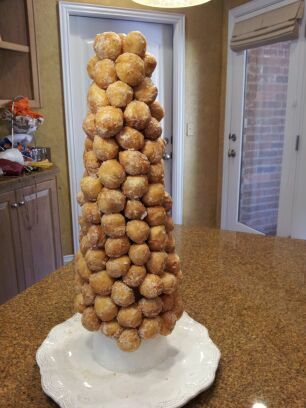 The Middle Sprout made a donut-hole tower ‘mock-up’ before the wedding. We needed to be certain we could recreate it for the reception. Appears to be a perfectly acceptable donut tower, right? We both liked the ‘mock-up’, but we thought it should be a little larger…or wider or something. After showing this photo to some of her friends, comments were made about our tower appearing to be …well….somewhat phallic. Is that necessarily a bad thing? Anyhoo, while shopping for the perfect styrofoam shape for our tower, I became inspired. In the floral section of the local craft store, there were styrofoam balls of various sizes. We would construct a donut topiary. 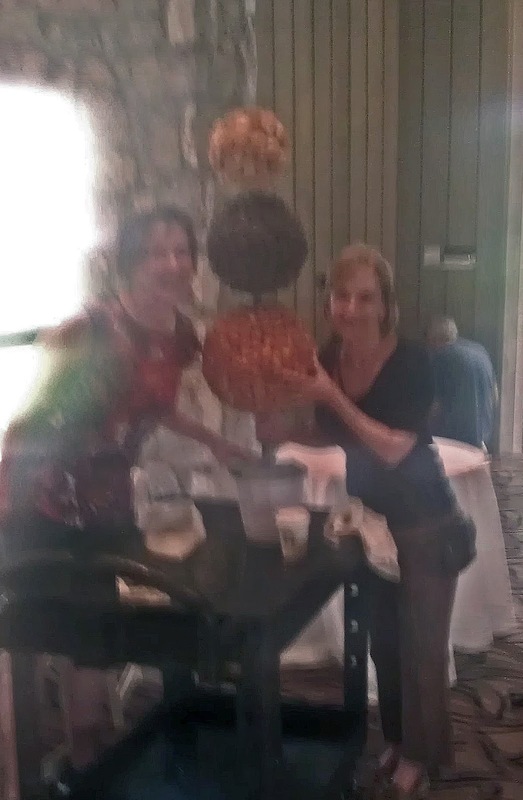 No one in the history of weddings has ever had a donut topiary! 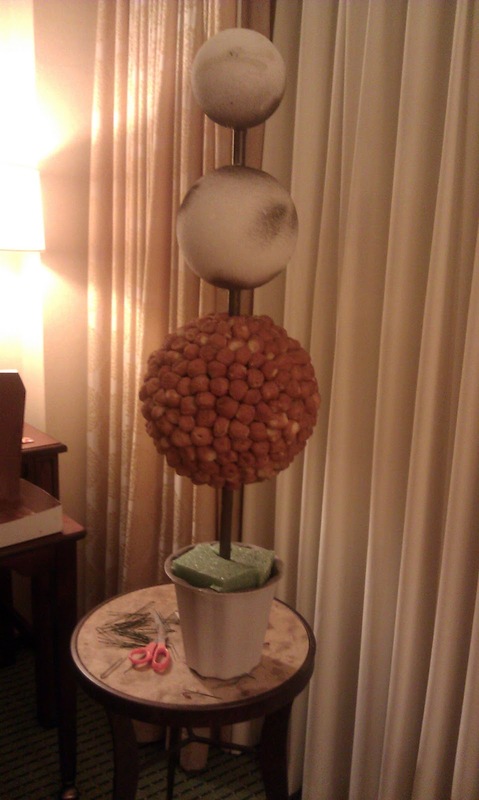 The Sprout thought a 2 ball topiary would be adequate….but, nooooo….I insisted we needed a giant 3-ball donut topiary. We bought a big pot, some large wooden dowels, and 3 balls of graduated sizes. In hindsight I realize, sometimes good is good enough. It’s fine. Really. No one knows the difference. However, in my quest for absolute donut-tower awesomeness, things began to get complicated. The Middle Sprout was racked with doubt. The Texan was trying to devise a plan to safely construct my grand vision of an outstanding donut topiary. No problem, I said. Took it to my handy-dandy florist who constructed the topiary with a steel rod through the center. He sunk the contraption in plaster and we were good to go. ‘Mom….it sure is BIG. You think it will be OK?’ The Sprout confessed to losing sleep at night over our ever-enlarging tower. It was morphing into the Washington Monument. I have to give her credit….she TRIED to rein me in. 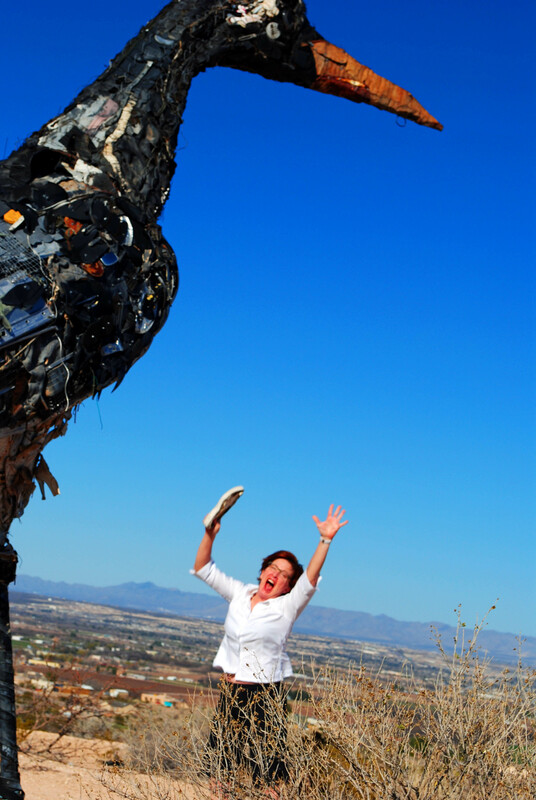 Sometimes, my quest for awesomeness can be overwhelming. Armed with the tower and 30 dozen donut holes, we headed for the Texas hill country. The first night in our hotel room, I eagerly began construction. The first grand styrofoam ball ALONE took all 30 dozen donuts and 2 hours of my time. I had a blood blister on my index finger from inserting toothpicks into styrofoam. Ouch. The beginning of the grand ball. 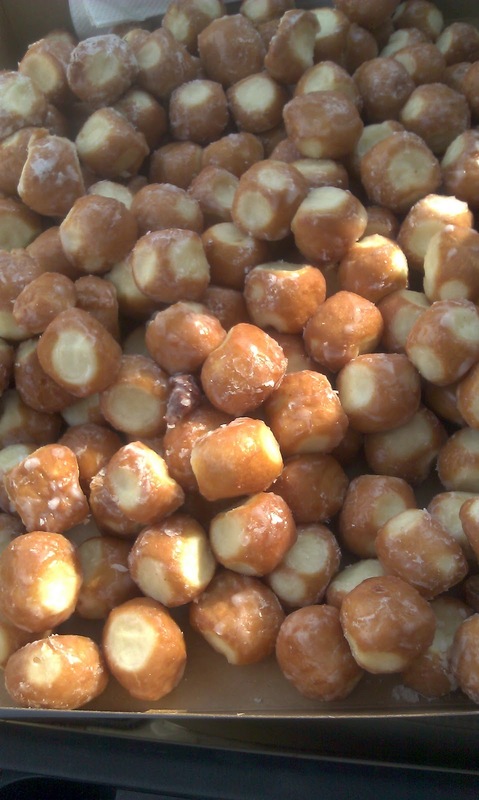 That’s 30 dozen donut holes! Fell in bed that evening dreaming of donut nirvana. Just needed to order more donuts in the closest town to complete the massive project. The next day, my long-suffering…very bestest friend in the whole world…who would do anything for me...little V...agreed to help with the project. We drove to the bakery where we ordered more donuts. When I asked for our order, the guy at the counter and the owner spoke to one another in loud, accusatory tones…the language was Vietnamese, I think. Seems they had sold our donut holes and only had 4 dozen left. Maybe that would be enough to do the smallest ball at the top….we paid for them and left. What to do now? We needed LOTS of donut holes in a hurry. Walmarts to the rescue!! We raided every last box of their chocolate cake donut holes to cover the center ball. Little V, the Middle Sprout and her friend J, and I worked on that donut tower until it was blessedly complete. The topiary was listing a bit, but we were undeterred. 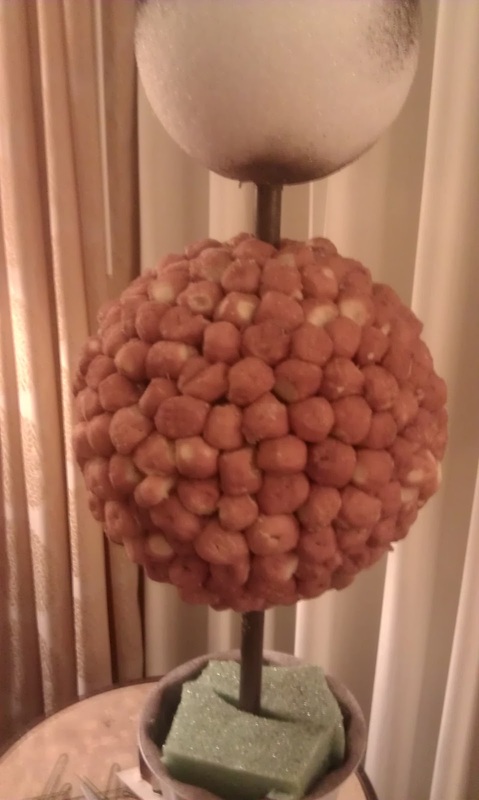 The creation contained at least 60 dozen donut holes and it was over 4 feet high! It was almost taller than Little V! This story is getting too long, so I’ll spare you most of the details of getting the donut contraption (probably weighed over 50 pounds) to the reception hall. It involved several awestruck young bell-boys loading it into a hotel car to drive the short distance to the venue. This donut Washington Monument took on a life of it’s own as it precariously swayed with every careful slow turn of the car. The donut topiary was heavy and becoming increasingly unstable. I sent Miss V into the reception hall for some sort of cart, while I held the swaying topiary in the car. Just as precious Miss V starts for the car with the cart, the skies open up and it begins to pour. A Noah’s ark-type of rain. Sheets and sheets of rain and a driving wind to boot. Lucky we had just done our hair for the wedding! We lug the ship’s-anchor topiary slowly up the ramp to the reception hall as we are soaked to the bone. We bravely saved the monstrosity from certain destruction several times. Did you know that wet donut holes weigh LOTS more than plain, dry donut holes?? Sorry for bad photo. Phone pic with very bad back-lighting. We are drenched, but feeling an uneasy sense of accomplishment. I’ll post a better photo when the wedding photos come out. Our creation was leaning so badly from it’s car ride and the drenching rain, it refused to stand upright. We worried it could fall over and injure someone at the reception. The Texan to the rescue! He walked (in the rain) to the beach at the nearby lake and came back with some wet sand. We filled the topiary’s container with the wet sand and it seemed to stabilize the wobbling a bit. The hotel staff filled the cupcake papers with the fresh donut holes and things were good to go. Lots of folks took photos of the donut-topiary. I was a bit concerned one of the happy, dancing children on the dance floor would run into the donut table and be severely maimed. An unsuspecting lady tried to eat one of the soggy, stale donuts off the topiary and she was told it was for ‘display only’. What a horrible waste of food!, she huffed. The lesson? I need to calm down. Awesome is not necessarily better all the time. Good is plenty good enough. I should listen to my Middle Sprout. I’ve told her 5000 times how she was right and why couldn’t she ‘rein me in’? But I’ve got one helluva donut wedding story. Lots of love to the bride and groom!